Today we bring you an article about Bulova watches review cause Bulova watch has rapidly gained popularity for the production of unique, innovative, precise and technological watches all over the world. Bulova is an iconic American watch brand headquartered in New York City. In 1912, the founder of the company Joseph Bulova opened his factory in Switzerland for the production of Bulova watches. Currently Bulova is one of the best watch brands in the world. Bulova’s artistry, elegance and heritage are still in line by offering range of modern watches for men and women. Their watches are renowned for its quality, style, affordability and an extremely amazing history. Are Bulova watches are good? Which one should i choose? Just check out our Bulova watches review below, it will surely give you the answer. Pros: 1. An expensive looking watch at a quite good price, big, heavy yet elegant. 5. Water resistant to 300 m (984 ft). Cons: 1. May be too big and heavy for some people’s wrists. 2. The hands are not luminesent, can’t read time in the dark. 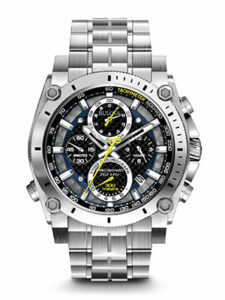 Bulova Men’s 96B175 Precisionist Watch is a sophisticated, sporty and unique watch which is accurate to 10 seconds per year. The entire watch is made of stainless steel starting from the case, dial and band. But the complete steel look has added an extra value to the watch. 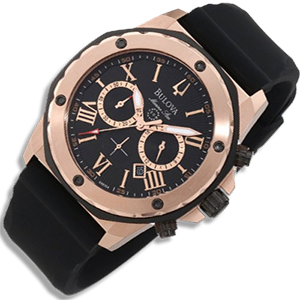 The watch features some amazing specification which makes it one of the best Bulova men’s watches. It has a round multiple-layer black dial with yellow element which has added more fun to the design and look of the watch. The display has four sub-dials with chronograph functions and tachometer markings. The round case diameter is 46.5 mm and the thickness is 17.5 mm. This clearly shows that the watch will not go unnoticed even in crowd. The dial window is made of mineral which makes the dial very sturdy and protects the watch from exterior damages. The watch not only deliver outstanding performance but the most accurate time. Its elegant design with stainless steel case and bezel make it a type of watch that every man would want to wear. On the other hand, the watch is water-resistant up to 300 meters. This makes it a great watch for every occasion. Whether you are swimming or diving, partying, playing sports or attending corporate meetings. With all these wonderful features the watch seems very expensive but amazingly its price is under 500$. So, it is still affordable. On the whole we can say it is a watch worth wearing by every classy man full of attitude, style and passion. It is a bit heavy and thus it might not suit some people’s choice. But if you can manage the weight of the watch you are free to show a full on attitude wherever you are. Pros: 1. A great, simple sleek and stylish watch at a very affordable price, elegant yet classic. 2. The leather band is very soft and comfortable to wear. 3. The hands are clean simple and dignified. 4. Can complement both formal and informal attire. 5. Water resistant to 30 m (99 ft). Cons: 1. The band looks too cheap. 2. The date window is a little small. 3. The second hand doesn’t line up perfectly. 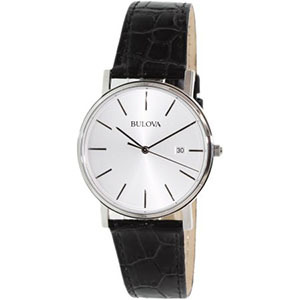 Bulova Men’s 96B104 Dress Watch is a simple dress watch with clean design suitable for offices and formal occasions. When it comes to simplicity then Bulova Men’s 96B104 Dress Watch is the one that comes at the top of the list from Bulova collection. The timepiece has a white circle dial that displays time. And it has a small sub-dial window at 3 o’clock which shows date. The dial has three silver sticks to display the time and looks very sleek. It shows the time and date very clearly. Its bezel and case of the watch is made of stainless steel and offers the watch a polished and shiny look. The case diameter is of 37 mm and 5.9 mm in thickness. The dial window is made of mineral material which makes it a durable watch. This watch is very easy to wear because of its size, weight and the band material. The band is made of black leather material with buckle clasp that offers a comfortable and safety wearing experience to the user. The watch has featured an analog display with three-hand Japanese quartz movement that displays accurate time to the wearer. On the other hand, you can also adjust the time of the watch very easily. It is water resistance to 30 meters (99 ft) ,this makes it can withstand splashes or brief immersion in water. On the whole, it is a best watch for people who are looking for a wonderful watch under $100 to maintain a classy style as well as to get accurate time. Pros: 1. It is very eye-catching but not too flashy. 2. The watch goes well with both casual and dress clothes. 3. It was very easy to set the time and date,and also easy to read. Cons: 1. The watch may be too big for some people’s wrists. 2. The rubber band is not very comfortable to wear. Bulova Men’s 98B104 Marine Star Calendar Dress Watch is an excellent watch from the Marine Star Collection. The watch is made of high-quality Japanese movement with chronograph performance that tell you the exact time. With this watch in your hand, you are not only improving your look, attitude and style but you will never be late for anything again. The dial of the watch is designed in a very stylish form. The outer part of the dial is covered by an octagonal shaped black frame. And following that there is a gold-tone stainless steel bezel which has nice side cuts and black screw-down accents. The black dial rounded with the bezel contains three chronograph sub-dials. The dial also displays a logo of Bulova at the 12 o’clock position, gold tone hands or Roman numeral indices and date window at 4 o’clock position. This watch has used water resistant black rubber band that complements the dial perfectly. The band is attached with the dial with a gold tone stainless steel case by angled edges. 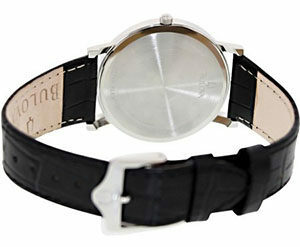 The overall design make it an elegant timepiece for men with full on attitude and style. It is water-resistant to 100 meters, so it is suitable to wear while swimming and snorkeling. But In general, it is not suitable for scuba diving. However, as because the date window is at the lower right corner and positioned between the sub-dials, sometimes it becomes very confusing to find the date at a glance. But when you are used to it, it would not be a problem. This is a perfect watch that can be used in any occasion. And as it is not made of leather band there is no need to worry about sweat tarnishing the band. Pros: 1. This is a gorgeous, high end watch at a fabulous price. 2. Elegant design, looks expensive and has a beautiful and easy-to-read face. 3. It is suitable both formal and casual attire. 4. Water resistant to 30 m (99 ft). Cons: 1. It goes through batteries a little faster. 2. The watch may be a little small for some people’s tastes. 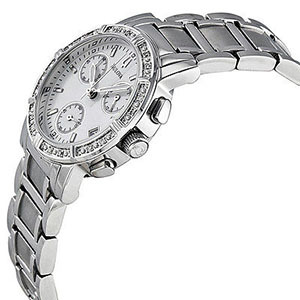 Bulova Women’s 96R19 Diamond-Studded Chronograph Watch is a very professional watch. It is especially designed for women as it give a very girlish appeal at first sight. 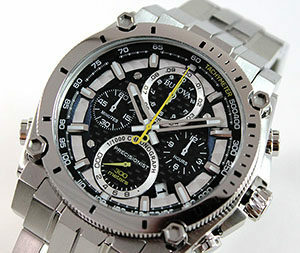 It can serve a number of purposes of its wearer due to its chronograph functions. Though this versatile feminine watch looks tough with the diamonds studded on its frame, it is still affordable than other watches in its class. 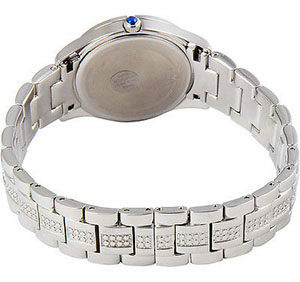 This watch includes a round dial with pearl like lustre as it has bezel studded with diamonds. It has three chronographic sub-dials, a small window at four o’clock and fluted crown to give is an amazing look. Its three sub-dials display sixty minutes run, time for 24 hours and small seconds. There is a mineral dial window on its 33 mm stainless steel case with analog display and Japanese quartz movement. Though it is resistant to water up to 99 ft or 30 meters but normally it withstands brief immersion in water or splashes of water. It is not suitable for swimming. The frame of the white dial is pearlised by sixteen diamonds which make this chronographic Bulova watch look more elegant. The dial of this watch looks perfectly round with a stainless steel second’s hand, a date window at 4 o’clock hour position and illuminating markers and hands. The attractive stainless steel link bracelet with invisible double locking clasp makes it more presentable and easily wearable. 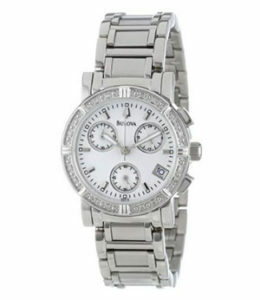 So, Bulova Women’s 96R19 Diamond-Studded Chronograph Watch can be the best option for you if you are looking for an affordable but stylish watch. You can wear it easily to look more elegant, graceful and feminine. Pros: 1. It looks expensive, elegant and classy at a great price. 2. The watch is very eye catching and the face is clear and easy to read. 3. Crystal on all over the bracelet and all around the watch makes It looks like a beautiful bracelet than just a watch. Cons: 1. You may need have to remove a link or two for a better fit. 2. The clasp that buckles the bands is little hard to close and open. Bulova Women’s 96T14 Crystal Watch is made of real Swarovski crystals and lustrous stainless steel to present itself as a stunning timepiece. The round case featuring a dial glistening with mother-of-pearl is made of polished steel. It also has silver colored dot markers and a pair of small Dauphine hands to show hours and minutes. 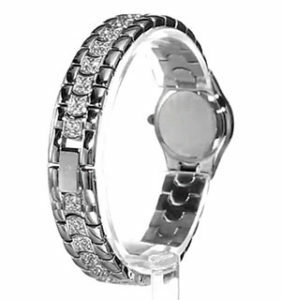 The small shining round cut clear crystals are studded all around the dial as well as along the center of the steel bracelet. Its bracelet is provided with a delicate jewellery fastener to open and close it whenever needed. The 22 mm diameter and 6 mm thickness case is scratch resistant and stylish due to a crystal bezel it has. It is provided with Japanese quart movement for its smooth running. And it is also water resistant up to 99 feet or 30 meters. In order to give dazzling accent to this watch Bulova has used genuine Swarovski crystals on its polished stainless steel case. The slim second’s hand, dot markers in silver tone and Petite Dauphine hands on the dial also shine with the mother-of-pearl crystals. Bulova Women’s 96T14 Crystal Watch is produced by combining latest technologies with the tradition of excellence of this company. The 96T14 Crystal Watch is one of the most sophisticated and elegant watches created by Bulova to make its customers happy. So if you like stylish and sparkling watches then 96T14 Crystal Watch is the best choice for you. Pros: 1. Classy and beautiful watch, looks very expensive. 2. The watch is very comfortable and easily goes with any outfit. 3. It is a good size and is easy to read. Cons: 1. The watch may be a little big for some people’s wrists. 2. The clasp was a little tricky to get on and off in the beginning. Until today Bulova watches are known for their accuracy and precision. They try their best to provide the most accurate watches to their customers. In fact accuracy is more related to passion than engineering and technology. Bulova is widely recognized for the countless innovations and always provide watches with extreme accuracy. 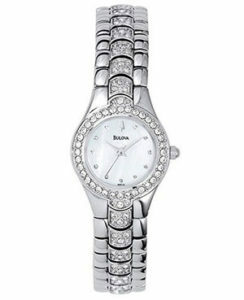 Bulova Women’s 96L116 Crystal-Accented Watch has Swarovski crystals and mother-of-pearl crystals set in the links, bezel, hour markers and lugs to make it look gorgeous. This watch has a 30.4 mm diameter stainless steel case, and a mineral window on its dial. It contains analog display with Japanese quartz movement. The stainless steel bracelet is provided with a deployment buckle to close or open the watch from your wrist whenever needed. Though it can resist water up to the depth of 99 feet or 30 meters, it is not suitable for swimming. It can only withstands splashes or brief immersion in water. 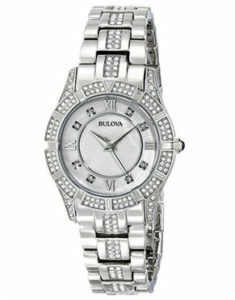 Bulova 96L116 Crystal-Accented watch is a nice accessory for the women of all ages due to its elegant and gorgeous looks. Its stunning rectangular stainless steel bezel gets alive with sparkling Swarovski crystals studded on it. The white mother-of-pearl studded on the Roman numeral indices at 3, 6, 9 and 12 o’clock positions give this watch a soft glow. 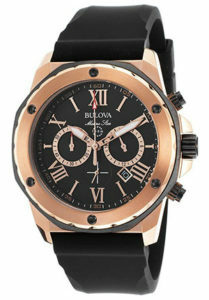 However, Bulova 96L116 watch is one of the watches produced with the extreme accuracy of time and richness of elegance. If you are looking for a watch with rich look then this watch can be the best option for you. After going through this Bulova watches review article, we are sure you have your own idea that which one to choose. In a word, it is no doubt Bulova is one of the most popular brands that produce high quality watches. Some of Bulova watches surpass other brands for their smart design dazzling looks. They offer wide range of high end watches from which you can choose as per your preferences.